The fourth of July is fast approaching and the internet is flooded with fun dessert ideas. I, personally, am a lover of cookies. Don't get me wrong, I also love cake, pies, and other assorted pastries too. But cookies are a handheld treat that are typically quick to make and the recipes usually make fairly large quantities that are perfect for a crowd, or just a cookout with friends. 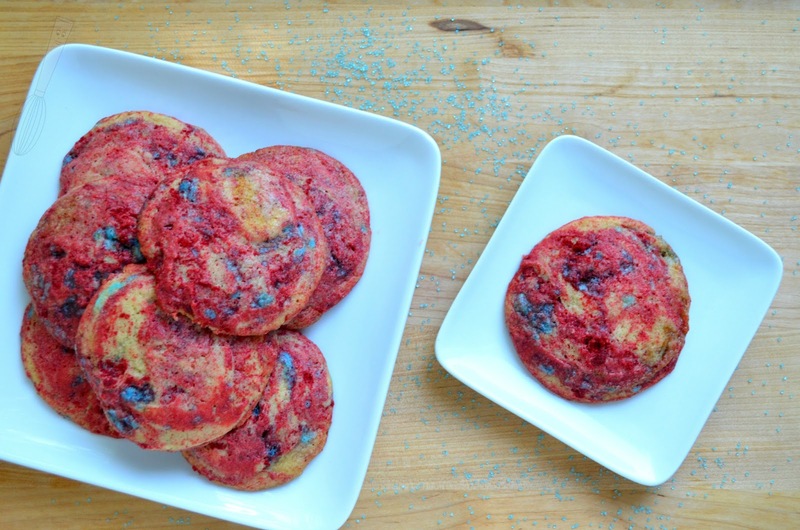 These Firecracker Cookies are bright and great for making ahead. 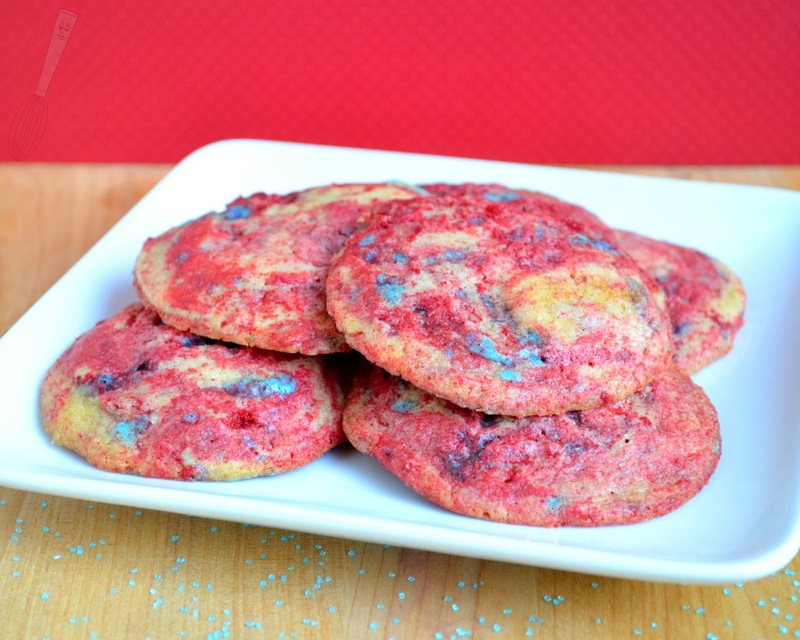 If you're looking at the cookies, you're probably wondering what makes them red and blue in such deep hues. Well, that would be cake crumbs...and sprinkles. 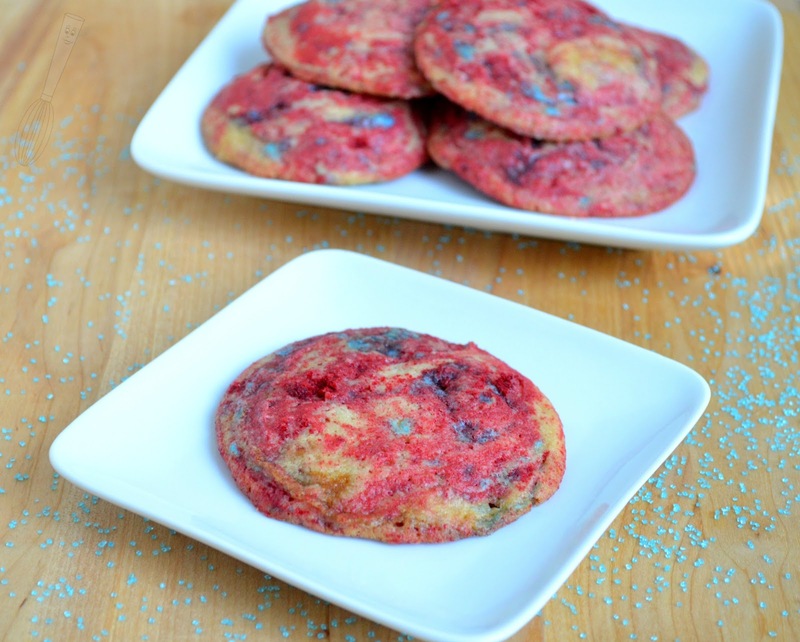 I find that adding cake crumbs to the cookie dough gives it a rich color that is difficult to achieve with just food coloring. Preparing the cake first may take a little time (not too much, about 30 minutes including baking), but isn't making the dessert ahead helpful anyway? These stay soft for days in an airtight container, and the cake could be prepared a few days out too and frozen. Freezing the cake is optimal anyway because if you want to cut it then it should be frozen for at least an hour or so. If you plan on breaking the cake into pieces then you don't need to freeze it. I got a little wild and made my own sprinkles. That is definitely a day before project that takes 10 minutes of prep time then a day of setting up time. I used the recipe from I Am Baker and cut it in half. I didn't change it in any way and just added a neon blue food coloring to the icing mixture. I really just didn't want to go buy a whole container of blue sprinkles that would sit in my cabinet for who knows how long before I used them again. So, that's why I decided to make them. It's easier than you think and just basic ingredients. I also wanted the sprinkles to explode in the batter as it baked and not hold their shape in the cookie. The final product looks pretty much like I want it to because I was hoping for swirls of red, "white", and blue. If you use store bought sprinkles in the cookies then they will probably hold their shape in the final product. I knew I wouldn't achieve a bright white cookie but I was more concerned with the red and blue anyway. I will also say that I made the recipe for the cake using half the box, and only used half of the pan of cake. With the other half, I made more Red Velvet & Blueberry Trifles. You could always just frost it and have a small rectangular cake, make cake pops, or cut it in cubes and make another type of trifle with cream and fruit. I know using half a box of cake mix seems annoying but it's helpful to be able to do so that you can make multiple desserts and not just one cake :). What you see in the cookie in the picture above are tiny pieces of cake, which add a little texture and make the aesthetics a little more fun, don't you think? As always, feel free to comment or e-mail me with any questions you have :). Happy Baking! 1. Preheat oven to 350F. Line a 12” x 12” (or 9” x 13”) pan with nonstick foil. 2. In the bowl of a mixer stir together the cake mix, egg, water, and yogurt until blended. Mix on medium speed for about 2 minutes. Pour into prepared pan and bake for 10-12 minutes or until a toothpick inserted in the middle comes out clean. Cool in pan. 3. Cut the cake in half, reserve one half for another use. Freeze the cake half for at least 1 hour, then cut into ¼” cubes or break it into small pieces. 4. In a mixer, blend together the butter, brown sugar, and powdered sugar until fluffy. Add the eggs and vanilla extract, mix until blended. 5. Add the flour, baking soda, and salt. Mix until just blended. 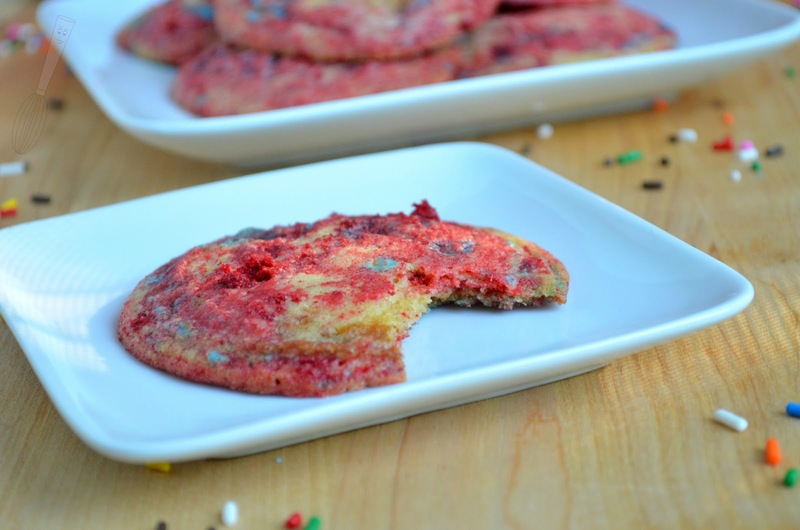 Stir in sprinkles and red velvet pieces until just blended. Scoop in 2 tablespoon portions onto a cookie sheet lined with a Silpat or parchment paper. 6. Bake for 12-14 minutes or until lightly browned and cooked through but soft in the middle. Cool on a wire rack.